Kyoto University (Japan) and Agropolis International in Montpellier (France) have signed in December 2014 a Memorandum of Understanding to promote academic cooperation and student exchange which includes joint research projects and publications as well as short term programs and visits. This MOU is valid for 5 years. - 25 students and professors from the University of Kyoto and Meijo (Japan) visited, from August 28 to September 7, 2015, the Institut des Hautes Etudes de la Vigne et du Vin (Montpellier SupAgro) to attend a training session on the short food supply chain in the Languedoc-Roussillon region. Topics: history and changes in winegrowing activities in Languedoc-Roussillon, transfer related to winegrowing and wine, guided wine tasting and discovery of local food. The president of Agropolis International underlined the institutional and partnership context which has been favoring the exchanges between France and Japan for 7 years. 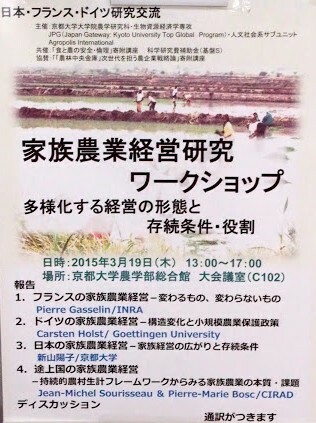 Workshops organized by Kyoto University (Graduate School of Agriculture and Social Sciences and Humanities Subunit) and Agropolis International in collaboration with scientists of several joint research units of the scientific community:Innovation, Moisa, Art-Dev, Gred, in partnership with CIRAD and INRA institutes. 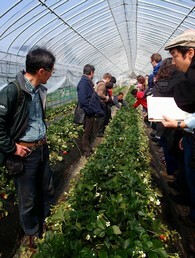 Exchanges between students of Agropolis International and Kyoto University.